On January 1st, 2006, one of the largest UN peacekeeping operations of its time will quietly depart Sierra Leone, handing over its responsibilities and legacies alike to the first ever UN integrated peacebuilding mission in a post-conflict context, UNIOSIL. I have been following the drawdown of the UN presence in Sierra Leone for some time now, both in my previous role analyzing economic agendas in civil wars and rule of law issues at the International Peace Academy, as well as here at CGD. The Financial Times has named Google founders Sergey Brin and Larry Page, both 32, "Men of the Year" (subscription required) for the transformative effect their company is having not only on the Internet but on the worlds of business and technology. The FT notes that the Google founders "have never been shy about their outsize ambitions." 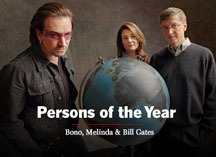 Within days of Paul Theroux's misguided complaining about Bono and Bill Gates (see The Novelist's Burden), they and Melinda Gates were named TIME Magazine Persons of the Year. Nora Lustig a CGD Board member and an early and effective advocate for combining sound macroeconomic policy with effectively targeted social programs, is the focus of a thoughtful profile in this month's F&D, the quarterly magazine of the IMF. Three years ago the World Bank said that freeing international trade of all barriers and subsidies would lift 320 million people above the $2 a day poverty line by 2015. But new World Bank projections emphasizing $1 a day poverty and based on new data and methods put the number at just 32 million people. CGD/IIE Senior Fellow William R. Cline, author of Trade Policy and Global Poverty, has been examining the Bank's new calculations and argues that the first estimate was closer to the truth.